HOUSTON (KTRK) -- Former President George H. W. Bush and former Secretary of State and Mrs. James A. Baker, III were in downtown Houston Wednesday for a dedication ceremony to rename the Preston Street Bridge after former politician and prominent Houston businessman Robert Mosbacher Sr.
Houston City Council voted unanimously in December 2014 to rename the bridge after Mosbacher, who served as Bush's Secretary of Commerce in 1989. The initiative was funded almost entirely through private donations. Bush and Baker were good friends of Mosbacher. 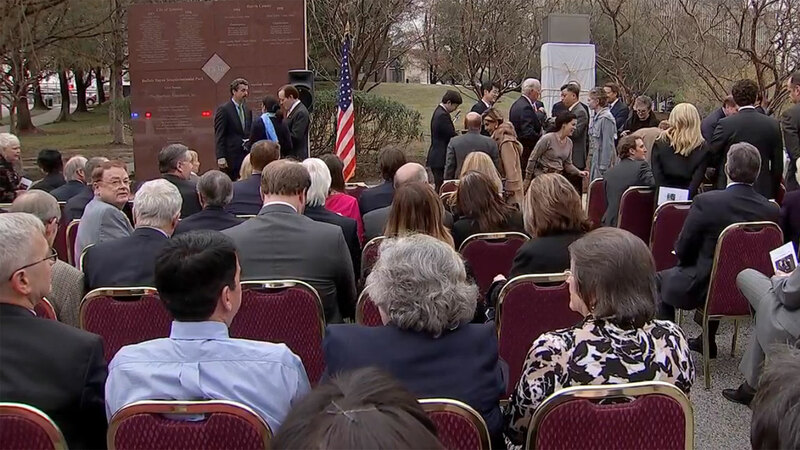 The Mosbacher Bridge will link the statues of Bush and Baker, which sit on either side of Buffalo Bayou.